The World Cup winner continues to toil at Manchester United. 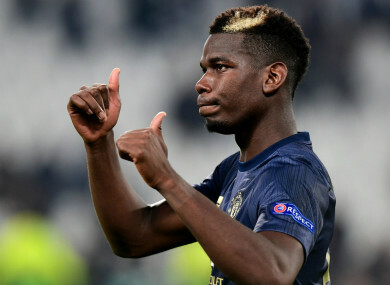 PAUL POGBA WOULD be “one of the best players in the world” if he played for Jurgen Klopp or Pep Guardiola, says Michael Owen, with Manchester United manager Jose Mourinho holding him back. The World Cup-winning midfielder was returned to the Red Devils side last night for a Champions League clash with Valencia, having been stuck on the bench of late. He was, however, to endure another frustrating evening in Spain, with one golden opportunity squandered as United slipped to a disappointing 2-1 defeat. Further questions are now being asked of Pogba’s future at Old Trafford and the role Mourinho is playing in his development. Former United striker Owen believes the 25-year-old is not getting the support he needs, telling BT Sport: “I think the manager has to take some of the blame — the system, the way he plays. I remember when he first signed they were trying all kinds of midfielders in and around him trying to get the best out of him. Owen added: “I’m of the opinion that he is totally world class playing in a certain team in a certain way. I get very frustrated watching him because I know he’s better than what we see week in week out. Email “Owen: Pogba would be one of the world's best if he played under Klopp or Guardiola”. Feedback on “Owen: Pogba would be one of the world's best if he played under Klopp or Guardiola”.